A group of Hun School students traveled to New Hope, Pa. to visit the Philips’ Mill Community Association’s Youth Art Exhibit. The trip, one of several Resident Life excursions offered to students last weekend, was a chance to see their artwork on display and explore a nearby town. Among the students on the trip, which was open to boarding and day students alike, were Grey Simon ’20, Lucy Law ’20, and Anastasiia Zubyk ’20, who all had art accepted into the show. “It was really encouraging and uplifting for me to see my own work on display among so many great artists. I thought that having such an opportunity could really help student artists like myself display their work,” Grey said. Artwork at the show was submitted by students from 20 area schools in four local counties: Bucks and Montgomery in Pennsylvania and Mercer and Hunterdon in New Jersey. For some of the artists, it was their first time sharing their work with an audience outside of the Hun community. 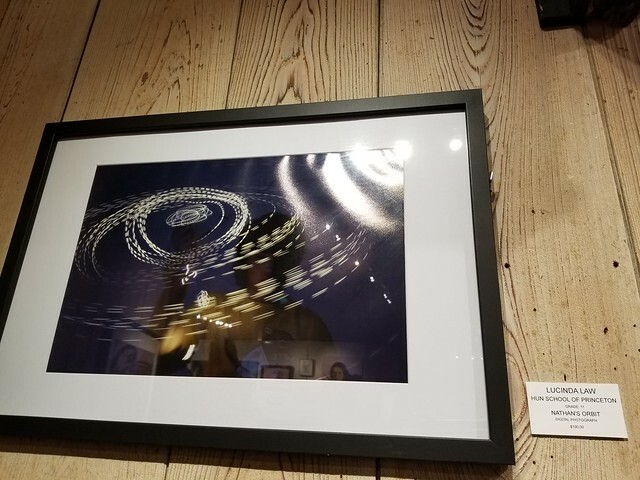 “This was the first time I’ve had one of my photos on display at an art exhibit, and it was a somewhat surreal experience. I’m delighted that I got to share my work with other people,” Lucy said. "I was surprised when a gentleman came up to me and asked about the technique I used to capture the photo. He said he really liked it, which surprised me a bit. Going into this exhibition I was proud of what I had created but wasn’t sure if others would see my work the same way. This experience has made me want to attend more art exhibitions, not just to see my photos on display, but also to see the art that my talented peers have created." Aside from Grey, Lucy, and Anastasiia, five other Hun artists had pieces in the show: Kelly Liu ’20, Erika Lee ‘20, Sabrina Niu ‘20, Renna Goldsmith ’20, and Lauren Johns ‘19. This year’s exhibit had only one juror, who was responsible for awarding $3,200 in prize money. Kelly won third prize (and $100) in the painting category for her piece, Blinded by Color. Visual Arts teacher Stacy Collingham said her AP Art students used this as a learning experience, as they will soon send their artwork off to the College Board for scoring by art teachers from around the country. “I don’t always agree with the awards, but it’s interesting to see the students go up and accept their awards, and see how they present themselves,” she said. Ms. Collingham also enjoys the insight into other schools’ art curriculum. “It’s interesting to see what other schools are doing, what assignments they have and what techniques they’re working on,” she said. The art show wasn’t the only highlight of the outing: the group also had time to eat lunch at New Moon Cafe, explore downtown New Hope, and practice their photography skills in a new setting.